Send us your current broken engine to have it rebuilt to new again. 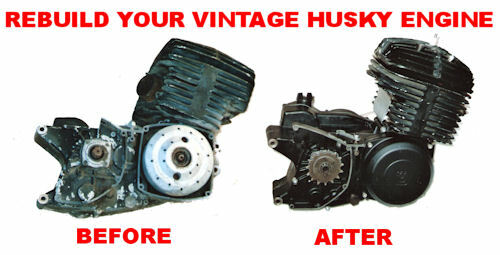 We specialize in rebuilding Vintage Husqvarna motorcycle engines between the years of 1970-1988. Your vintage engine will be repaired by a professional VINTAGE Husqvarna motorcycle mechanic that ONLY specializes in 70's and 80's Husqvarna motorcycles. We prefer to repair as many of your current parts as possible including broken cylinders, heads, cranks, crank cases, rods, side covers, gears, exhaust, and much more. If repair is not an option, then we have new, used, and reproduction parts to replace with. We also offer custom made parts such as pistons, rods, transmission gears, bolts, or any other part that is needed where replacement parts are not available. That's right!! We can make pistons, gears, and more from solid steel for vintage Husqvarna motorcycles. If we can't find the part and do not have anyone to refer, then the only option left is to machine a replacement part. Estimated Cost to Rebuild Your Engine is $800-$3500 depending on current condition and options chosen. We cannot give exact cost of repair until we have completely dismantled and inspected engine. After inspection, the price and options will be presented for your decision. For questions or to get started, call 360-761-4325 or send email to info@HusqvarnaOUTLET.com.